Convenient parking near Alfred's on Beale is available at the Parking.com locations listed. Click on the location address for location hours, rates, detailed location information, and a map. 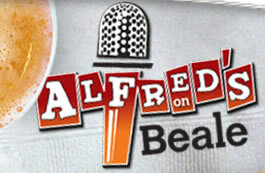 Alfred's on Beale is located on Beale Street, near the Memphis Rock N Soul Museum, Gibson Guitar Corp & Factory Tour, and the FedExForum.